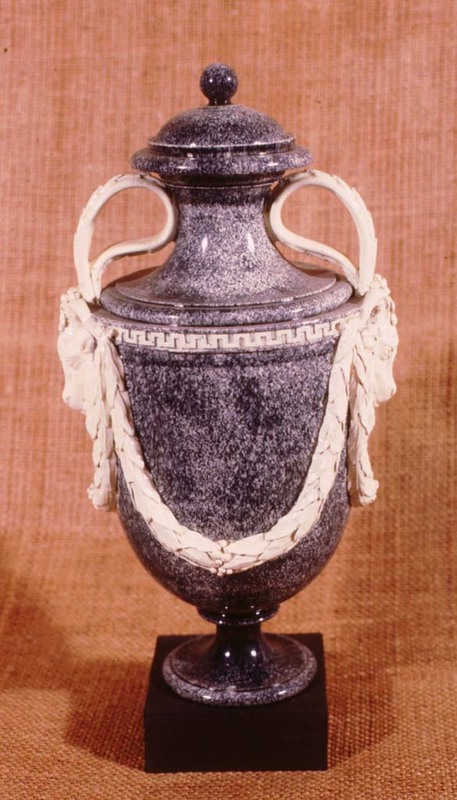 The Registry of Unique Wedgwood gives prominence to unique Wedgwood artifacts. Webster's dictionary defines unique as being without a like or equal, single in kind or excellence. 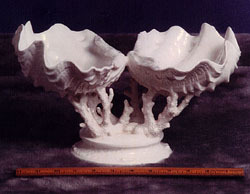 The registry will seek therefore to archive these unique examples of Wedgwood production for collectors all over the world. 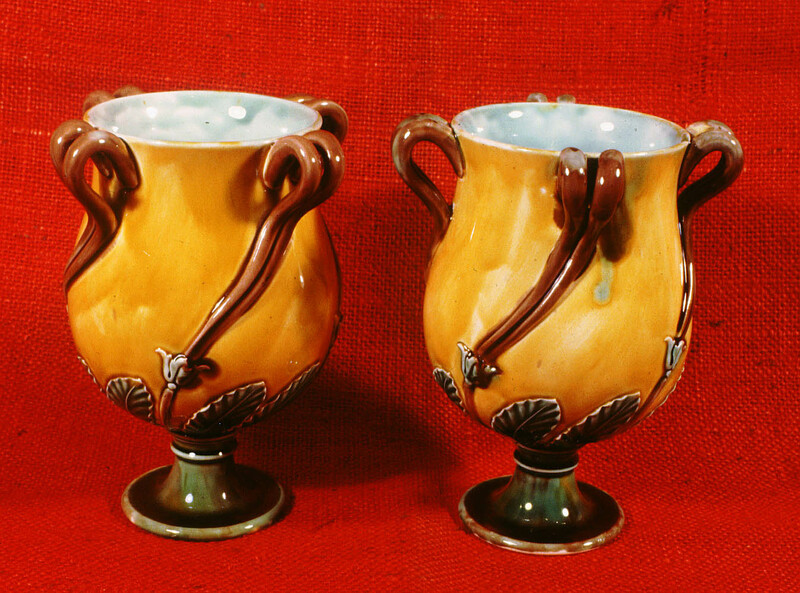 Item 1: A pair of majolica tendril vases. The vases are 6 1/2" tall impressed WEDGWOOD, an incised number and the three letter date mark for 1862. Several experts have made comments such as "very rare" and "never saw another". Maybe you can prove the experts wrong. Item 1: A Wedgwood and Bentley variegated vase. The handles are composed of grand loops terminating in goat head medallions. 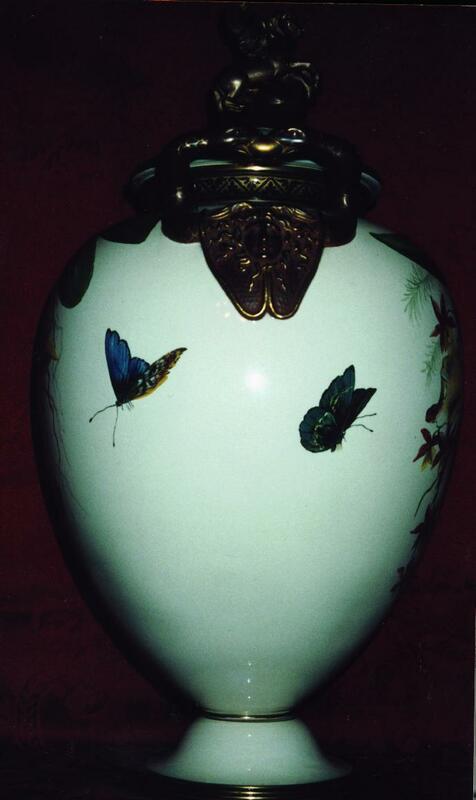 This vase measures approximately 11" to the top of the ball finial. 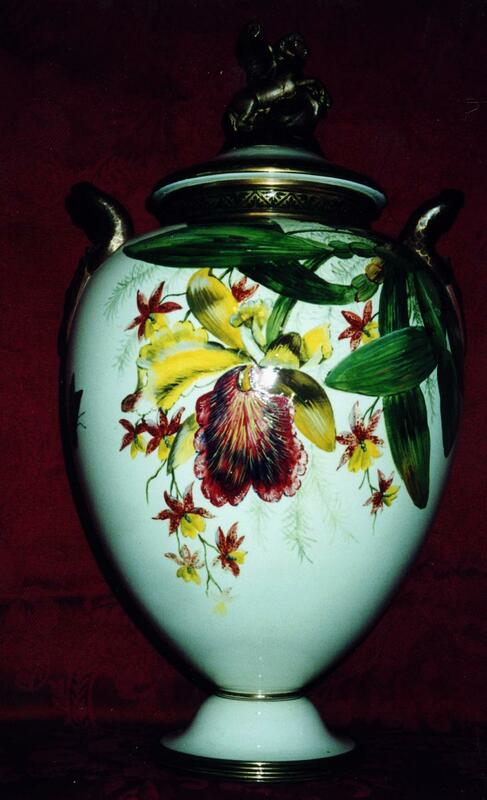 It is marked Wedgwood and Bentley around the 18th century hardware. 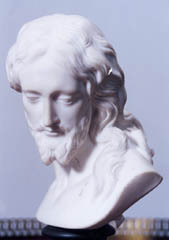 Item 1: A bust of Christ in carrera or jasper mounted on a basalt base. 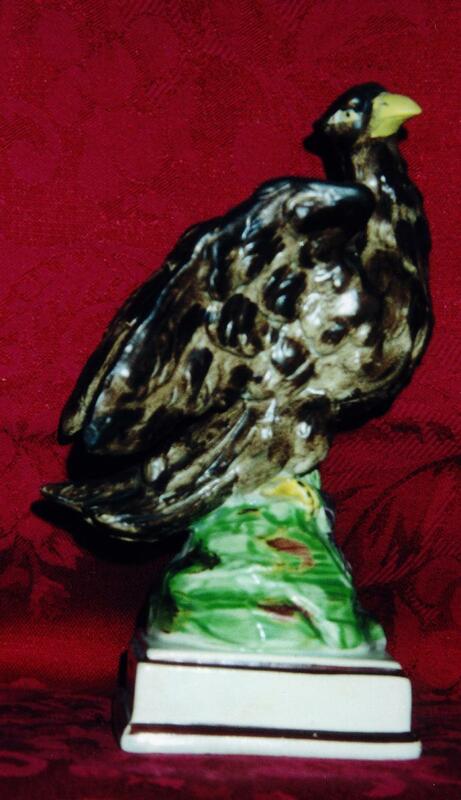 The piece is 7 1/4" tall and impressed WEDGWOOD on the shoulder of the figure. 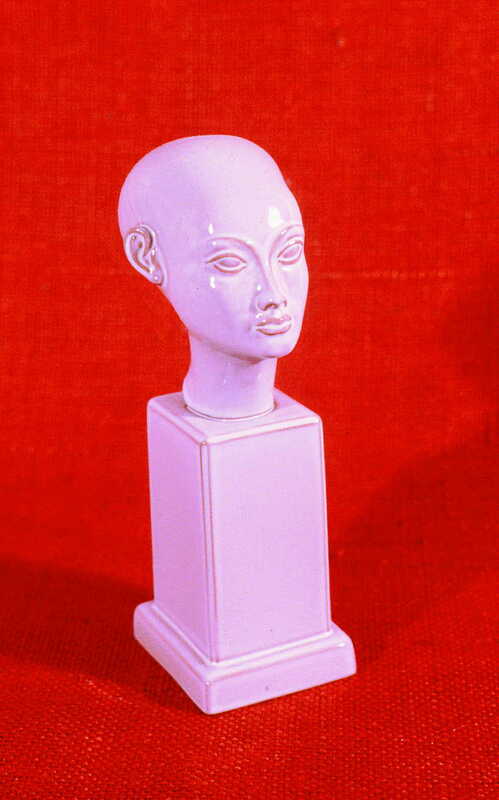 A similar figure in black basalt was sold by Skinner inc., sale 1501, April 1993, and is illustrated in Wedgwood Vol. II plate 735. 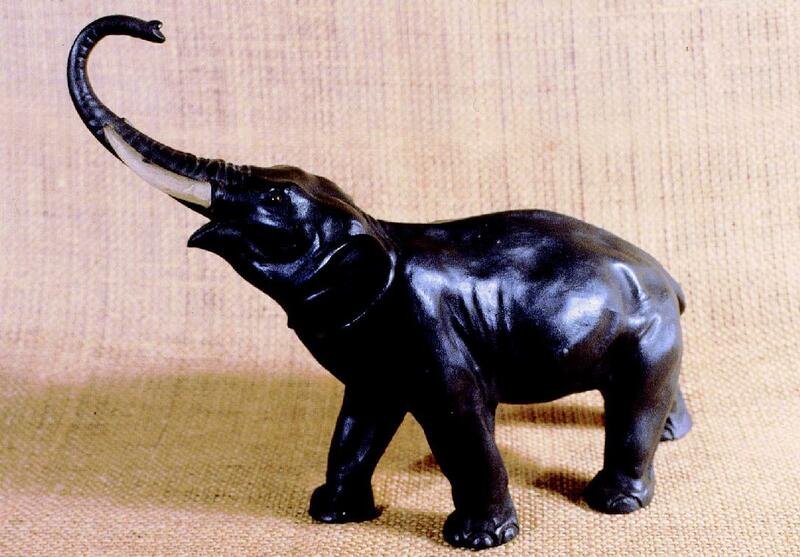 Item 1: A basalt elephant. We have all seen the small basalt elephants by Light, but this is something quite different. This pachyderm measures 7" to the top of the trunk and 9" in overall length. Also this figure has its trunk raised as opposed to the usual trunk down position. The eyes are made of glass and two white tusks protrude from the head. It is impressed WEDGWOOD and a thick `C'. I've never seen another but possibly there may be a tuskless version in the Beesen Collection because as everyone knows the "Tuscaloosa" in Alabama. Item 2: A bust of Nephertiti by Norman Wilson in terra cotta color jasper body with a rust and gray glaze, ca.1938. In her book, Three Centuries of Wedgwood, Barbara Wedgwood claims that only two busts were made in the terra cotta color and she possessed one of them that is unglazed (see page 93, figure 96). 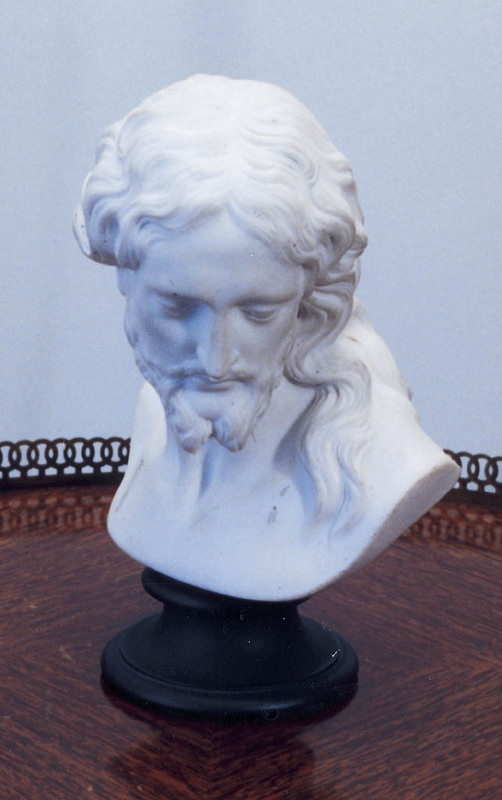 Other versions of this bust exist in moonstone glaze, and basalt, however even these are quite rare as these pieces were never made for sale, but rather exclusively as gifts. A white moonstone version may be seen in the Buten Collection. The bust is 7" tall and the base is 2" by 2". 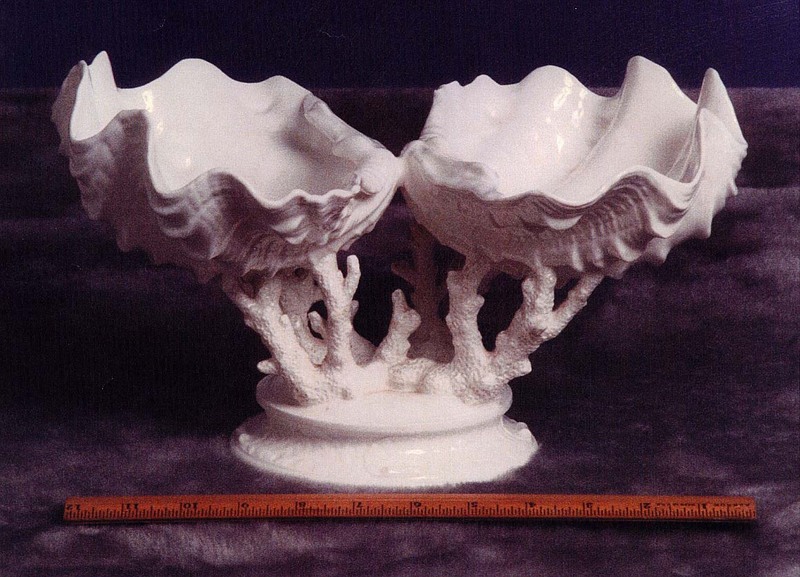 Item 1: Fine white china ornamental shells supported by coral stands from a particularly attractive series of 36 shell shapes designed for table decoration in 1894. Marked with the Portland Vase mark and shape number. This is shape 3 in the series: Two clam shells open on a base of coral. Marked WEDGWOOD in black letters with a brown Portland vase stamp with three asterisks underneath and the number "3". 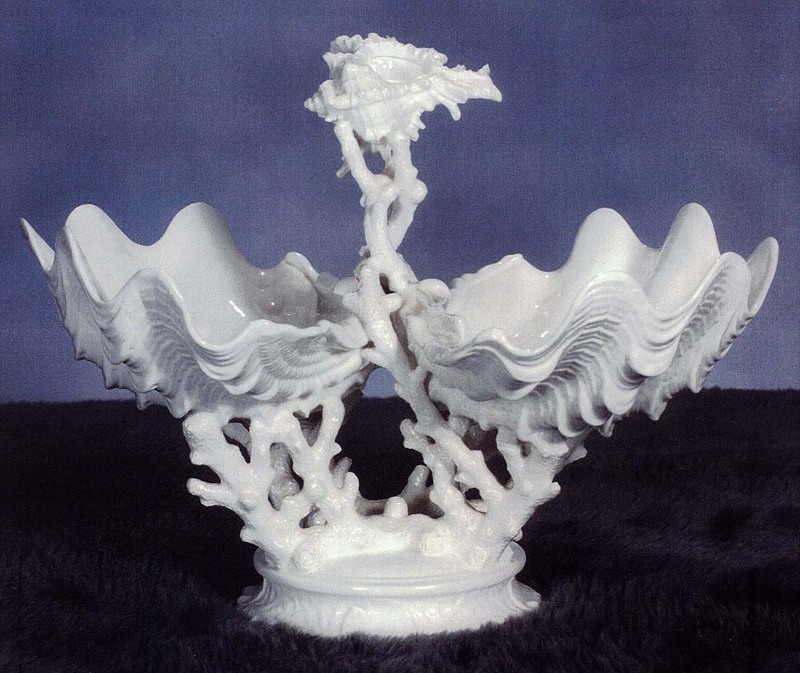 Item 2: Fine white china ornamental shells supported by coral stands from a particularly attractive series of 36 shell shapes designed for table decoration in 1894. Marked with the Portland Vase mark and shape number. 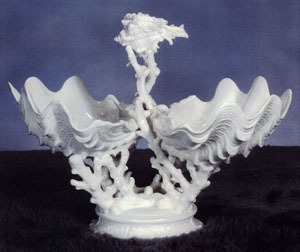 This is shape 5 in the series: Two clam shells open on a base of coral with a coral column rising above the clam shells supporting a conch shell. Marked WEDGWOOD in black letters with a brown Portland vase stamp with three asterisks underneath and the number "5". 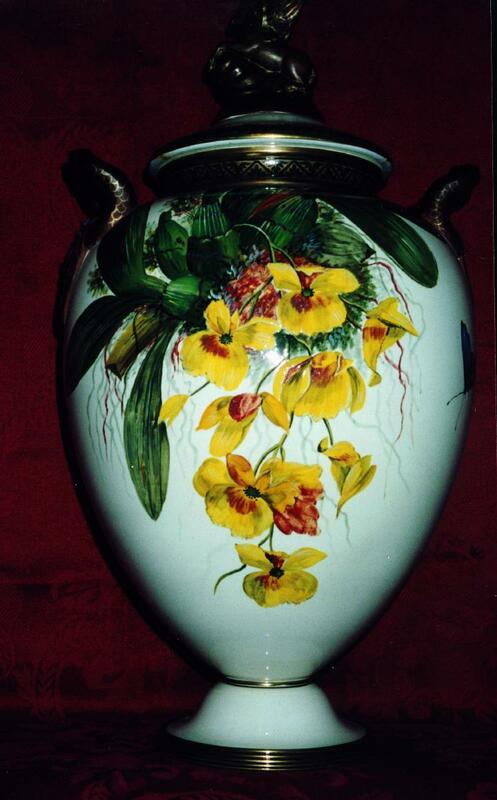 Item 1: A queen's ware Pegasus Vase decorated on both sides with Oncidium and Catteya orchids. Height 19" Mark: Wedgwood Impressed WOE, 27Z inscribed in gold. ca. 1876. Provenance collection of Byron Born.